The reputation of the R.I.P. 9 is unassailable – in the six years since its introduction it has helped define the new-school genre of trail ripper both with riders and the cycling press. So how can it be improved? Keep the attitude, boost performance, shed unwanted weight and build on the legend. The changes to this new beast can’t really be called “evolutionary,” because the word implies a slow process of incremental gains and small strides. That just doesn’t describe the changes to the new R.I.P. 9 – there’s nothing incremental about a kick in the pants. The Niner that is at home on just about any trail or any terrain – The R.I.P. 9 incorporates global rider feedback as well as Niner’s rigorous progression of alloy design, engineering and testing standards. The R.I.P. 9 has over 30 glowing media reviews for ride quality and handling - the new R.I.P. 9 takes these characteristics and ups the ante with air formed aluminum alloy tubes that redefine performance, a lower weight, ISCG compatibility and additional travel. The R.I.P. 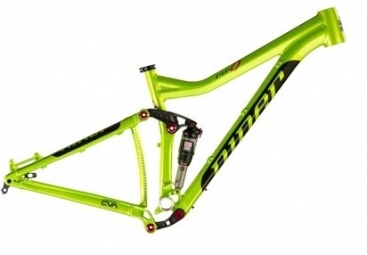 9 features Niner’s patented CVA suspension (U.S. Patent No. 7,934,739) and delivers 125mm of fully active travel with superb compliance and damping via a tuned for CVA RockShox Monarch RT3 HV shock. For those seeking the technical advantages of 29” wheels combined with pedaling efficiency across all chainring combinations (not just the middle ring), CVA™ is the front-runner. The result? A faster, smoother ride up and down the trail. To progress as a rider you need predictability, balance and nimble handling and Niner is the company that first made fun trail bike 29ers a reality. Climbing or descending, the geometry of the R.I.P. 9 is tuned to keep you in control and ready to conquer new terrain at every turn. The R.I.P. 9 is intended for 120 to 140mm forks, allowing riders to further fine tune the ride. At just 7lbs for a medium frame, the new R.I.P. 9 pulls within .65lbs (295g) of our carbon flagship R.I.P. 9 RDO frame. To achieve this reduction and actually increase strength over the last R.I.P. 9 frame we looked beyond traditional hydroforming. Shaping the frame tubes with compressed air in a heated mold gives us greater control over wall thickness and material uniformity, allowing the use of less metal. Tubes that are manipulated using this process can be up to 25% lighter than a similar hydroformed shape at the same strength. The increased surface area of a tapered headtube allows for a larger downtube, increasing strength and rigidity at this critical intersection. Tapered fork steerer tubes measurably reduce fork deflection, which means your Niner tracks straight and true. The full spectrum of riders from XC racers to All Mountain shredders benefit from these features which is why we incorporate the technology in all our frames. 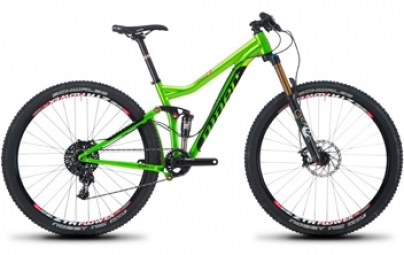 NINER Cadre RIP 9 AEROFORMED 29'' Vert clasificado 4.0 de 5 por 1.